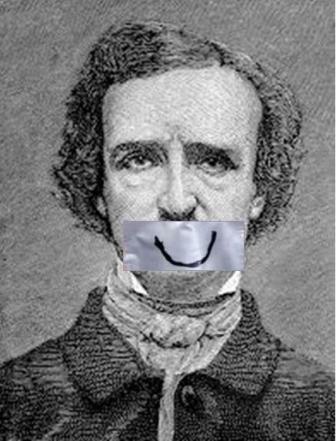 Time for someone to take their Lithium again…I meant me, not Sir Edgar Allan Poe. Lol!!!! Oh that Edgar! Not only is he depressed, he obsessed! I bet if we visited his home we’d find him hoarding thousands upon thousands of bells. Poor dear dreary Edgar. And to make matter worse, apparently he was born with two belly buttons which is probably the reason he was so dreary. I know I would be having to live with something like that! 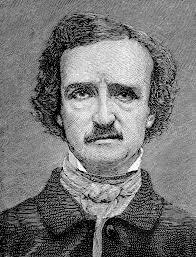 Nevermore to the bells. Have him shove one in each navel and learn to belly dance. I will never understand how people who write such dark stuff get so popular and people like us, who write to inspire smiles, get ignored. You’re going to need a bigger roll of duct tape and a whole box of markers. Now the image of Edgar Allan Poe belly dancing is a good way to start the day! I wonder, do people enjoy the thrill of being scared over the fun of laughing? Maybe what we need is a new genre: fear laughing — Silence of the Lambs starring Mel Brooks. Let’s call it “Silence of the Lamb-chops.” That’ll keep us out of trouble with those pesky copyright infringement lawyers and play well with Mel’s Jewish heritage. Sounds like fun, Linda. It’ll be hard to keep a straight face. LOL! Russell thank you for getting this idea all set up for me. Now all I have to do is get Mel to return my calls!